This article contrasts how a robust conception of director independence plays a central role in the corporate law world while, in the mutual fund industry, independence is a shrunken conception playing only a marginal role. Over the last twenty-five years, director independence in corporate law has gained wide acceptance as being desirable and it has become a critical component of fiduciary duty analysis. Within the mutual fund industry, however, independence remains fiercely contested. The more obvious battle over independence has occurred in response to the Securities and Exchange Commission's ("SEC's") rulemaking effort to alter the standard for granting certain regulatory privileges under the Investment Company Act (the "Act"). The SEC, among other reforms, sought to limit those privileges to companies where at least seventy-five percent of the directors, and the board chairman, are "independent." Twice, those rulemaking efforts have been struck down on procedural grounds. In late 2006, the SEC resolicited public comment on two studies addressing the costs and benefits of the proposals but has not yet reissued a rule. Independence is also important, however, under section 36(b) of the Act, which permits an investor to sue an investment advisor for breaching its fiduciary duty with respect to compensation for managing the mutual fund. In 1982, the seminal Gartenberg case articulated six factors to guide the determination of an excessive fee. One of the factors is independence but, unlike the case in corporate law, over the last quarter of a century it has remained a narrow concept of little significance, being referred to in only 29 of 139 decisions citing Gartenberg and playing no meaningful role in the resolution of any cases. In no case has an investor ever obtained a judgment under section 36(b). This article, after a critical analysis of Gartenberg on its silver anniversary, offers a proposal for reinvigorating independence in the mutual fund litigation context. It cites evidence that a more capacious definition of independence - one going beyond the related but narrower notion of "disinterestedness" - may correlate with the size of advisor fees. It advocates importing into the mutual fund world the fuller-bodied notion of independence that has evolved in Delaware over the last quarter century. There is no statutory or policy reason for the "independence" factor under Gartenberg - seemingly frozen in the early 1980s - not to similarly expand and so play a more significant role in fee litigation under the Act. Doing so will help restore private litigation as a vital component of Congress' regulatory strategy for protecting investors in mutual funds. Posted with permission from copyright owner. Lyman P.Q. 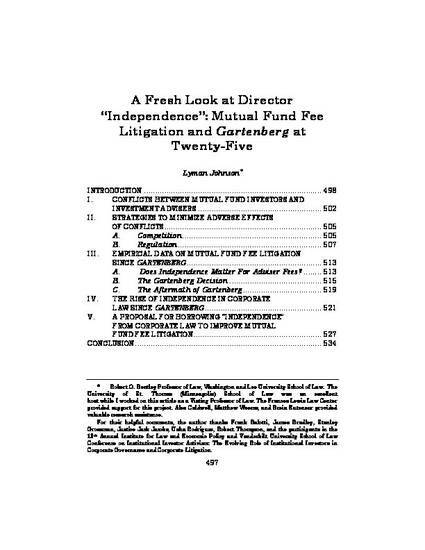 Johnson, A Fresh Look at Director “Independence”: Mutual Fund Fee Litigation and Gartenberg at Twenty-Five, 61 Vand. L. Rev. 497 (2009).